The money bubble has burst and the players are bagging up their chips for the night. We will bring you a list of all Flight C players, along with the combined Day 2 seating assignments in the next few hours. There are 73 players remaining, and 72 will make the money. When the field is thinned by one player the remaining players will bag up their chips for the night, and will return tomorrow along with the other advancing players to play Day 2 at 11 am. "Well, there are no more aces in the deck, I can tell you that much," a player at the table that is not involved in the hand says. 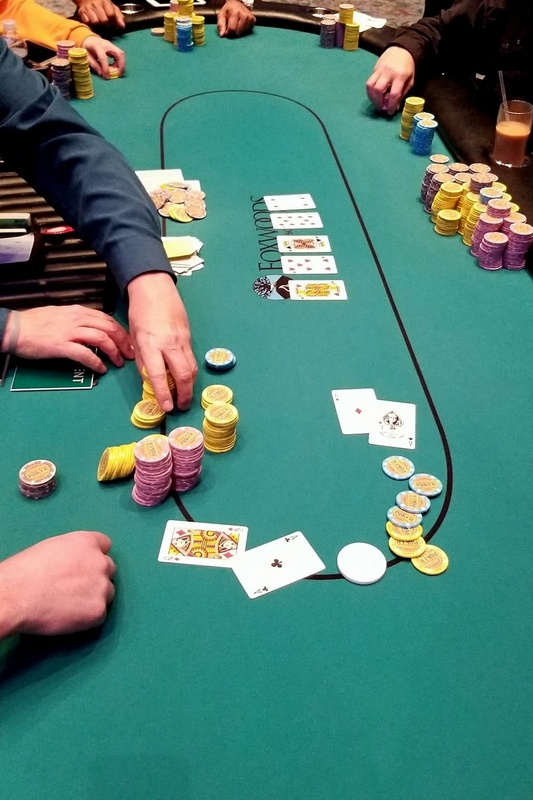 The flop comes K♠10♦4♦, leaving Ruvolo in the lead with his pair of aces. The 7♥ turn maintains that lead, but the J♥ on the river gives Beaudoin Broadway to double up. 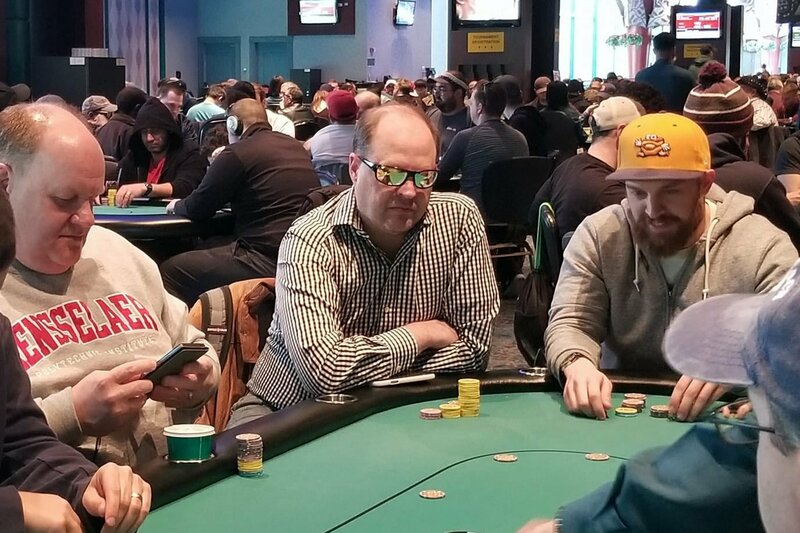 As the dealer is counting down Beaudoin's 103,200 in chips, Ruvolo says, "That's the second time that I've had aces cracked since dinner. Dealer, please dont give me aces again. The first time the guy hit quads one me...no more aces!" The remaining 127 players in Event #1, Flight C are now on a 60-minute dinner break. They will return to play Level 15 around 7:35 pm with 1,200/2,400 blinds, and a 400 ante. The average stack upon return from the break will be 93,858. As a reminder, this final flight will play down to 72 players before bagging up their chips for the night. The field has been dwindling, but there are still a significant amount of familiar faces left in the crowd. Of the notable chip counts, it's Soukha Kachittavong and Sam Taylor that are battling for the top spot in the chip counts. Both players have around 215,000 in chips, and both players clearly have the skills necessary to carry them through to the end of this tournament. Kachittavong and Taylor both have World Series of Poker Circuit rings, and both earned those rings here at Foxwoods. In August of 2017 Kachittavong won nearly back to back Circuit rings in Event # 8 ($365 No-Limit Hold'em), and Event #12 ($365 No-Limit Hold'em Re-Entry) for a combined total of $29,172. Sam Taylor won the $1,675 Foxwoods Circuit Main event in August of 2015 for $149,020, and since then has won the $2,500 Borgata Spring Championship Event #17 in April of 2017 for $390,103. There were a total of 596 entries in the final flight of the $600 No-Limit Hold'em Re-Entry Event #1. The field will play down to the 72 players before bagging and tagging later tonight. Those 72 players will join the 30 players that advanced in Flight A, and the 45 that advanced in yesterday's Flight B, and will play Day 2 on Monday at 11 am. All players that make Day 2 will return in the money, and any player that bags in multiple flights will take home $1,200 for each additional stack they bag, with only their largest stack advancing to Day 2. The prizepool for Event #1 will be posted as soon as it's available. Joe Heinzmann raises to 2,000 in the cutoff, and the player in the small blind calls. The flop comes K♦9♣5♠, and both players check. The turn is the 3♣. The small blind bets 2,500, and Heinzmann calls. The river is the J♣. This time the small blind bets 3,500, and Heinzmann quickly moves all of his remaining 8,000 in chips forward. His opponent quickly calls and turns over 9♥9♦ for a set of nines. But Heinzmann rivered a straight, holding Q♣7♣, to double up. In the final hand of the night, the bubble was burst by Stephen Song. But it was the second to last hand of the night, when Gennadiy Kostrov doubled through Cheryl Sloane, aces vs. kings, that determined the chip leader of Flight B. Kostrov doubled to just under 350,000, and ended the evening with the lead, while Stephen Song came in second for this flight.